Cruises to Mexico and Central America are among the most affordable in the market and may visit ports in the Pacific Ocean and the Sea of Cortez or in the Caribbean Sea. Explore cities in destinations such as the Mexican Riviera, Nicaragua and Costa Rica, as well as in the Yucatan region of Mexico, Belize, Honduras and Guatemala. Primarily departing from California, cruises on the Pacific side of this region usually find drier weather and more mountainous terrain onshore. Fishing, horseback riding on the beach, parasailing and many other sports abound. Or, opt for a Mexico/Central America cruise that departs from Florida or Gulf Coast ports like Galveston or New Orleans. You'll find a more humid climate, lush vegetation and warm, crystal-clear waters for swimming, snorkeling and scuba diving. A wide range of excursions are offered in this area, from scuba diving and snorkeling in Roatan to zip-lining in the jungle of Belize to hiking in Costa Rica's amazing national parks. Tours of ancient Mayan ruins at Uxmal, Chichen Itza and Tulum are also popular, and some Mexico/Central America cruises make stops near, or traverse, the Panama Canal. Mexico/Central America cruises are available year-round. Some Mexico/Central America cruises also visit ports in South America. Cruises to Mexico/Central America last 3 to 14 nights, but longer cruises are offered. 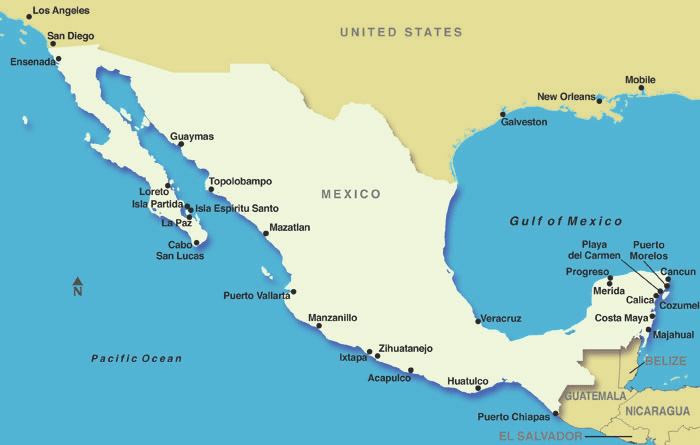 For a list of Mexico/Central America cruise ports, click here.